Another thing you might notice, is that most of these colors are in the semi-opaque and non-staining range of pigments. I sometimes use some staining colors and some that are more transparent, but I like the ability to lift paint so I tend to stay with these colors most of the time. In my classes and workshops, I don't require that my students bring all of the exact same colors that I use. 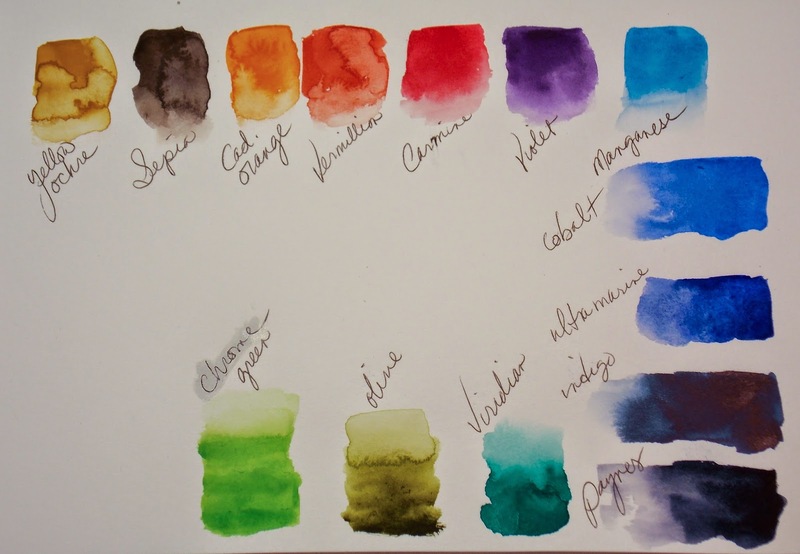 There are some colors that I just can't live without -- like indgo, payne's grey, and ultramarine, and my students that don't bring those colors to class will be lost! But other colors can be substituted with similar counterparts, like cadmium red for carmine, cerulean or cinerous for manganese, permanent green for chrome green, thalo green for viridian, or Quinacridone gold for ochre. Other colors can be mixed, such as using cobalt and alizarin to make violet, or indigo and ochre to make olive green. Actually, we do a lot of mixing in my classes. Indigo and sepia to create really dark greens in landscapes, violet and cobalt to create icy cold shadows, and a lot more. 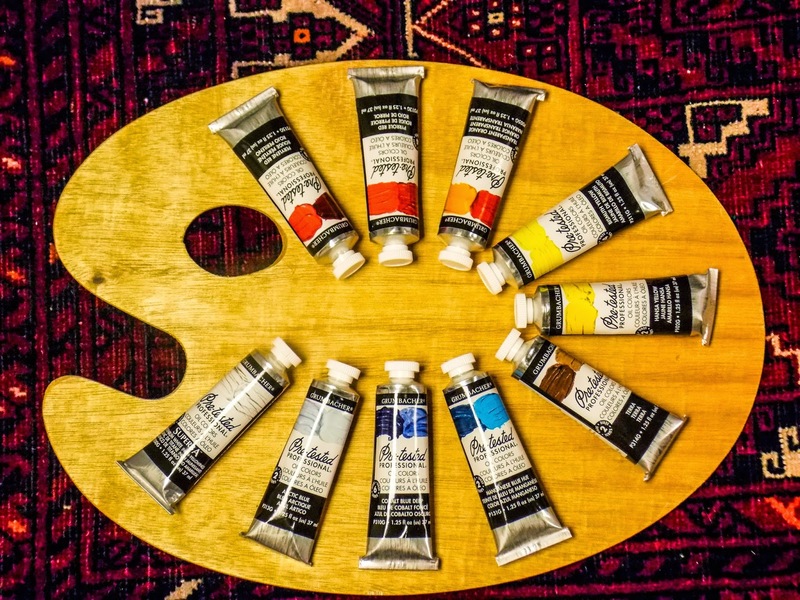 For oil painting, I use a split primary palette consisting of a warm and a cool version of each primary, plus titanium white. Depending on the subject, I add two or three additional colors to mix a wider variety of colors. Most importantly, I recommend that my students only use professional quality paints and materials in my classes and workshops. Student quality paints and materials are more difficult to work with and will not produce paintings of the same high caliber. I have new classes starting every month, both online and in my studio. Click on the "Calendar" link on the top of this page to see the full current listing. Annie Strack earned Signature Membership in 12 organizations including the International Society of Marine Painters, International Plein Air Painters, and she’s an Official Authorized Artist for the USCG. She exhibits internationally and has had 22 solo shows. An experienced commercial artist, she’s created designs for countless businesses and produced architectural renderings for architects and contractors. She’s the author of The Artists Guide to Business & Marketing, contributing editor for Professional Artist Magazine, and her DVD Painting Seascapes in Watercolor is broadcast on TV stations worldwide. She teaches painting at Artists Network University and travels around the world to teach workshops, jury shows, & paint en plein air. She’s an artist materials expert and represents artist supply companies to present programs at schools, art centers, and art stores. Her artwork has received hundreds of awards and hangs in over 1,000 collections worldwide including USCG, Navy, Pentagon, Senate, and Veterans Administration. All images and content copyright Annie Strack 2018 Although I occasionally receive compensation for some posts, I always give my honest opinions, findings, beliefs, or experiences on those topics or products. The views and opinions expressed on this blog are purely my own.